Along with a new umbrella, which we previewed in another post, a quality rain jacket is key to enjoyable golfing in the wet and cold winter months. Good rain gear can mean the difference between a round that leaves you damp and shivering and one that you enjoy from start to finish and are free to play your best golf all throughout the day. Rain gear is big business these days, with top golf companies putting serious effort into research and development to combine the best of water repelling and comfort into a single garment. The problem with most rain jackets from years gone by is that they were too restrictive when trying to make a golf swing. Sure, they kept the rain out, but at what cost? It isn’t much good to stay dry on the course if you are unable to swing in your usual fashion. At that point, you might as well just head in for the day because you won’t be playing golf like you normally are able to. The best rain gear on the market today is able to block all of the water being thrown at you while simultaneously giving you the freedom to make a good shoulder turn and full release. 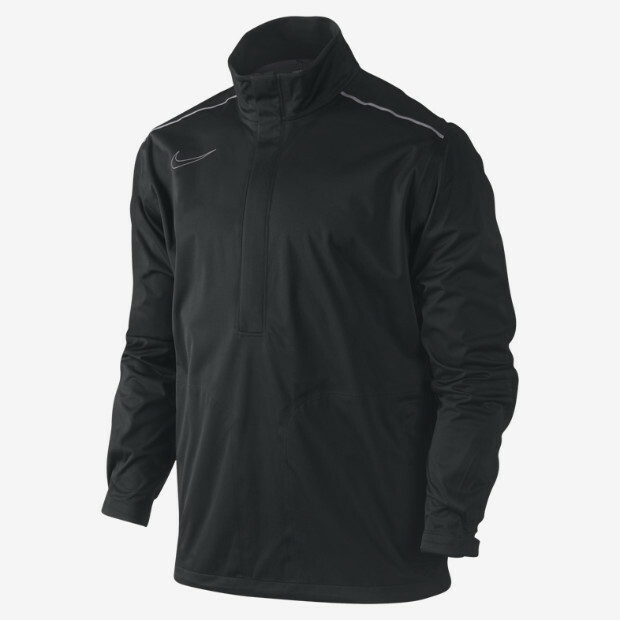 One jacket that has been successful in this quest is the Nike Mens Storm-FIT Rain Jacket. Offered in three colors, including black, grey, and blue, the Storm-FIT makes it easy to stay dry for 18 holes or more even in the heaviest of rains. The key to the jacket is both the Storm-FIT material that Nike has created along with the seam sealed design. There is no exposed stitching on the jacket, which is the usual place that water would make its way through to the inside. The jacket is unlined, which means you can dress how you normally would on the inside without having to worry about being too bulky when you through the jacket on. If the rain stops, simply take the jacket off and you will be dry, comfortable, and ready to go on with the day. Another feature of this rain jacket that you will appreciate is the mock neck that zips right up to your chin. Far too many rain jackets through the years have stopped down around the neck line, leaving an opening for you to get soaked when you bend over at the waist to hit a shot. Even when you are in your stance, the Nike jacket will remain close up against your neck, meaning you are staying dry at all times. The ends of the long sleeves have Velcro to tighten them against your wrists, and the hand pockets are covered with zippers to keep your scorecard and pencil dry and safe. Truth be told, most of us would probably rather not have to own a rain jacket. However, the reality is that sometimes the weather doesn’t cooperate with our golf schedule. When that is the case, having the Nike Mens Storm-FIT Rain Jacket in your bag will be a welcome sight. It is comfortable enough to let you keep playing your best – and looking sharp, too. Most golfers take a least a little bit of pride in their appearance when they hit the course. It doesn’t have to be a GQ outfit, but looking sharp while walking down the fairway does appear on most golfers list of things to do. From the shoes up to that hat, dressing in a style that is comfortable and classy will make you feel good about yourself – and who knows, maybe you will even play a little better as well. While there isn’t much creativity involved in picking out a golf shirt and some slacks, golf shoes are a different story. Finding shoes that are comfortable enough that you can play golf for hours in them without getting sore should be the main concern. However, you also want them to look good and coordinate with the rest of your attire. That goal can seem impossible when you first look at the shoes on the market. Of course, there are very classy (and very expensive) leather shoes that will look great – but your feet might be screaming by the turn. On the other hand, there are ‘tennis shoe-style’ golf shoes that you could probably play basketball in, but they don’t look good at all. Very few shoes accomplish both sides successfully. 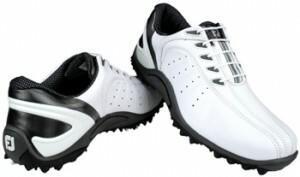 One such shoe is the FootJoy Mens FJ Sport Athletic Golf Shoe. This pair of shoes are some of the most comfortable around, and yet they look very professional. Offered in both white with black trim, and black with white trim, you will be proud when you arrive at the course in these affordable shoes. Equipped with soft spikes and a molded plastic sole, you are sure to keep your grip on the turf even when the weather gets a little soggy. Speaking of soggy weather, these FJ Sport shoes are totally waterproof thanks to a Proofguard membrane. They also have an athletic mesh liner that makes them more breathable than other, more expensive shoes. Full-grain leather uppers mean these shoes are built to last and will get you through round after round with no blisters and happy feet. Trying to play golf when your feet are angry is not a fun experience, so trust your toes to FootJoy and you will be comfortable no matter how long you are on the course. Better Golf through New Shoes? Beyond making you comfortable, these shoes can help your swing as well. External heel stabilizers are in place to make sure your swing doesn’t sway too much from side to side. The most important thing a golf shoe can do for you from a performance perspective is help to keep you on balance. The FJ Sports do just that, so don’t be surprised to find your game improving shortly after lacing these shoes up. It is always smart to replace your current golf shoes before they get too worn, so you can avoid damage to your feet. Opting for the FootJoy FJ Sport Athletic Golf Shoes is a great way to go because of their moderate price tag, durability, and long-lasting comfort. There are a lot of great things about the game of golf. The time you get to spend outdoors, competing with your buddies on the course, and trying to improve your game are all things that keep us coming back time after time. One thing that most of us don’t love about golf, however, is the cost of playing the game. Not only can greens fees get expensive, but you also have to deal with purchasing all of your equipment. Quality golf clubs can run into the thousands of dollars, and that doesn’t even mention golf balls, gloves, bags, clothing, and more. Simply put, golf can be an expensive hobby to keep. With that in mind, it is a welcome change when the opportunity arises to save some money in your pursuit of the game. Of course, purchasing less expensive clubs can be a catch-22 – trying to save money could lead you to inferior clubs that hurt your game in the long run. The trick is to walk the line between affordable and lower quality so you end up with a product that can get the job done without breaking the bank. 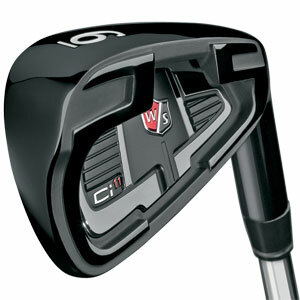 That is exactly what you will get out of the Wilson Mens Staff Ci11 Irons. This is a great looking set of clubs that carries with it the Wilson name and has the performance to match. You will instantly be impressed with the feel of these clubs, and nothing about them will say ‘discount’ at all. Everything from the graphics to the head design looks premium, but at a price that is more reasonable then some of the big name brands. To start, these irons are finished in black, which is a look that has gained popularity in recent years. The head design falls somewhere between blade and cavity back, giving the clubs a nice balance between control and forgiveness. The playability of these clubs will appeal to a wide audience because they are big enough to forgive some mis-hits, while not resembling a shovel on the end of the shaft. Players from low digit handicaps all the way up to 20 and beyond will be able to use these clubs right away and find that their games benefit from the switch. The offset in these irons is progressive, meaning it is largest in the long irons (4-5) and gradually gets smaller as the clubs get shorter. They are available in both left and right handed versions, and both steel and graphite shafts are also offered. When you see that the price tag for this set comes in at around half of what some other iron sets retail for, you will know you have found a winner. Don’t fall for the marketing – you can play great golf without spending a fortune to build your set of clubs. Make sure any set of clubs you purchase makes sense for your game regardless of the price tag, but don’t be scared away just because the Wilson Mens Ci11 Irons are more affordable than some other brands. All that means is you will have more money in your pocket to play golf more often – and isn’t that the goal? Enjoy these irons and play well!